I've really been missing my Apple, Gorgonzola & Walnut Pizza since I've been pregnant. I'm trying to be as good as I can with the whole unpasteurized cheese thing - so no Gorgonzola for me. And I really think that makes the pizza. I decided to try a new combo a few weeks ago - and it worked out really well. Here's my Spinach & Artichoke Pizza recipe. Set the oven to the recommended temperature for the pizza crust. Sprinkle the shredded Italian cheese over the pizza crust to completely cover. Add the chopped spinach to cover the cheese. 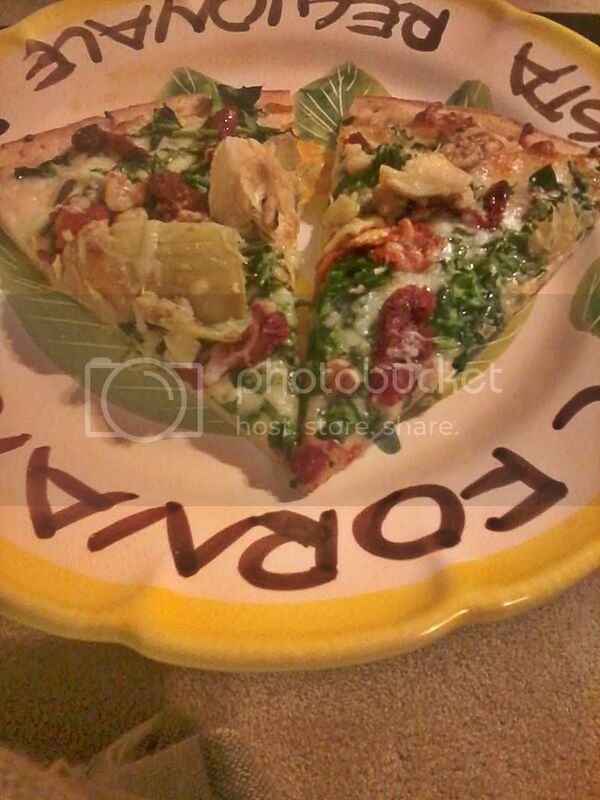 Spread the quartered artichoke hearts and sun-dried tomatoes around the pizza. Sprinkle with walnuts and Parmesan cheese and bake according to the pizza crust package directions. Easy peasy. Just like my other pizza. And its pretty yummy.